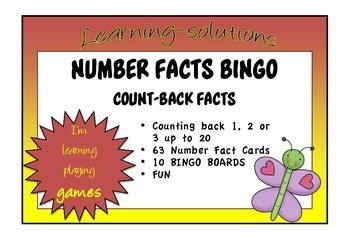 This package comprises 63 NUMBER FACTS CARDS and 10 BINGO BOARDS. DIRECTIONS are also included. I use these games to begin or end my Intervention Sessions for those students who need this level of skill. This is a difficult level, so I have added more boards so you can use them over your whole class with three students to a board. Each student has 3 counters each to cover the numbers that are called. Each Bingo Board has a number ladder for those students who need this level of support. Playing games provides your students with the fun and motivation to play over and over and this is what many kids need to learn these number facts.